As always, a warm welcome to the Railwaymedia Blog. As I mentioned in edition 38, I had a trip to Düsseldorf planned (albeit at quite short notice), the highlights promising to be two of the unique railways in the wider Nord-Rheine-Westphalia area. More of that later. We picked a good week to go for the weather, in fact Eurostar services this week have been cancelled because of snow and ice. Whilst it got cold some nights whilst we were there, most of the days were sunny and I actually managed to come back with a bit of a tan! The journey out was by Eurostar to Brussels, then by the excellent SNCB Inter-city service to Eupen. 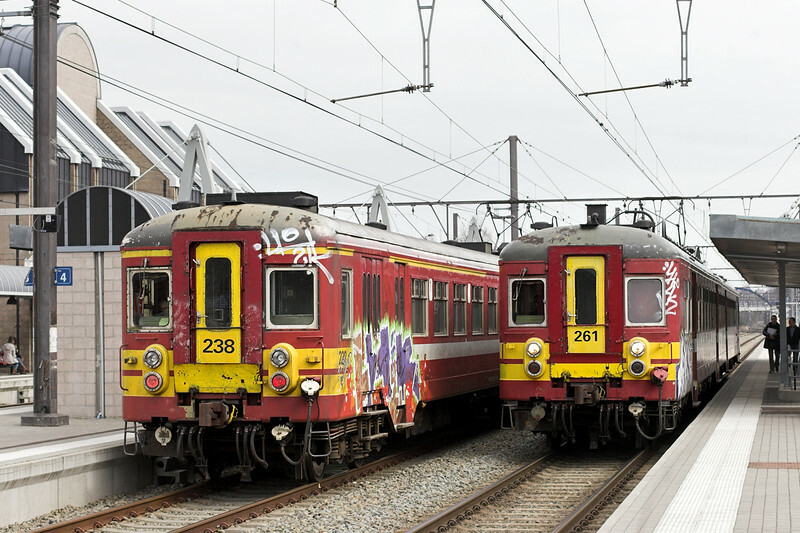 This service which originates from Oostende runs hourly and is formed by rakes of 12 Inter-City coaches. If you ever travel on these services, be it south to Liège or north to Bruges, get in the south end of the train furthest away from the loco. The way all the stations on the route are set up everyone joins towards the middle or north end so the other end is normally very quiet. 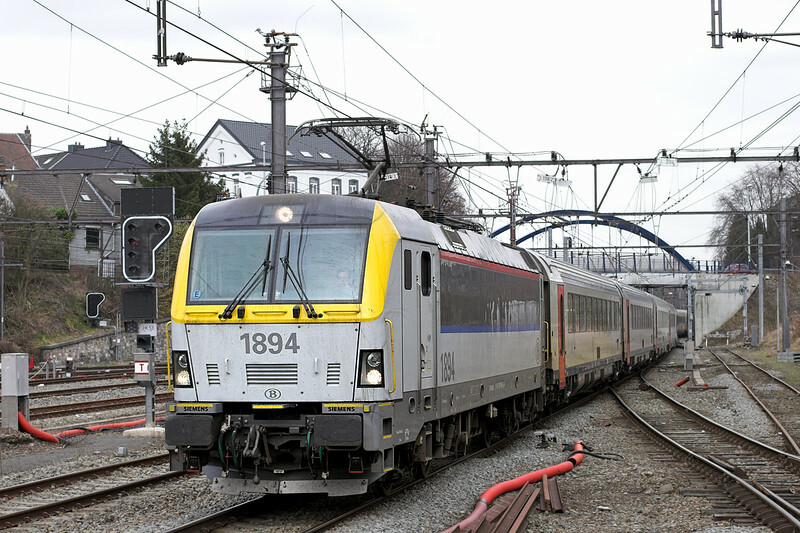 Besides the quick way to Germany by ICE or Thalys, the other option from Brussels over the border to Aachen is the Eupen service to either Liège (for a two-hourly local service) or to Eupen itself (for a regular local bus). We opted to go via the latter route, the first time I have crossed an International frontier by bus. You may remember last year we walked from Hungary to Slovakia, so I am slowly crossing off the various ways of entering a country. Hot Air Balloon might have to be next? With most of the day spent travelling, we only had time for an hour or two lineside near Langerwehe before making our way to our base at the Hotel Residenz in Düsseldorf. This is hardly a luxury hotel but was very clean, it is convenient for the station and does an excellent buffet breakfast. It worked out at about £30 a night, so well recommended. After dumping our bags it was off out to try some of the local beer, Alt. Worth visiting are the 6 brew pubs in the city, all of which only produce this beer. You don't actually get any real choice in what beer you get served, small half-pint glasses of Alt get plonked on your table and replenished whenever your glass empties. The next day we headed for Köln with the intention of going out to see the unusual coal railway to the north of the city. We spent an hour or so at Köln Messe/Deutz station, just the other side of the bridge over the Rhine from the Hauptbahnhof. This is a good station for watching trains, many of the regional trains are operated by locos in push-pull mode, though it is often a lottery as to what end of the train the engine will be. It is only a 10 minute walk across the bridge, which is what we did in order to catch the tram out to the edge of the city to the small town of Frechen. The Nord-Rheine-Westphalen area, as is common with most Länders in Germany, operate an area wide ticket. For the whole of the massive NRW area, on all trains, buses and trams (but not Inter-City trains) it is currently €28 for a day ticket after 0900, though it is only €38 for the same ticket for up to 5 people to travel together. 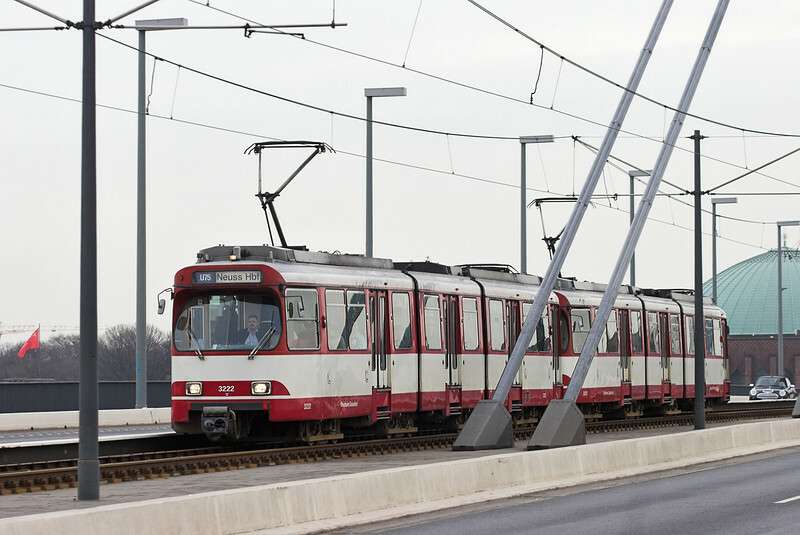 To reach our target of the unique Rheinbraun (link in German) Railway, we had a 30 minute walk from the terminus of Köln Tramline 7. As we neared the line we heard a rumbling and saw a train moving northwards. Unfortunately we then had to sit there almost 2 hours until the next one appeared. We summise they do track maintenance at dinner time. Anyway, it turned out to be worth the wait as once the first signal turned green there was a constant procession; indeed we got three trains in as many minutes thanks to the fact they ran two trains almost parallel on adjacent tracks. 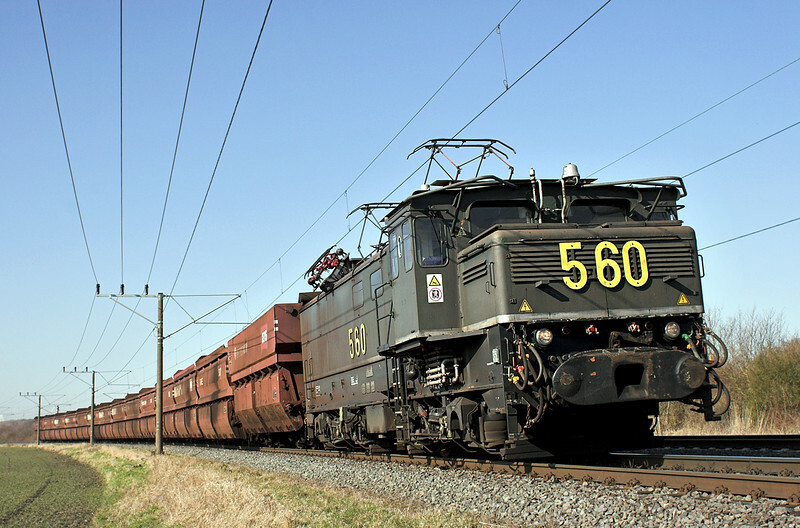 It is a private railway owned by the local Power Company and is primarily designed to move coal between the various Collieries and Power Stations. As such they are not constrained by normal working practices. 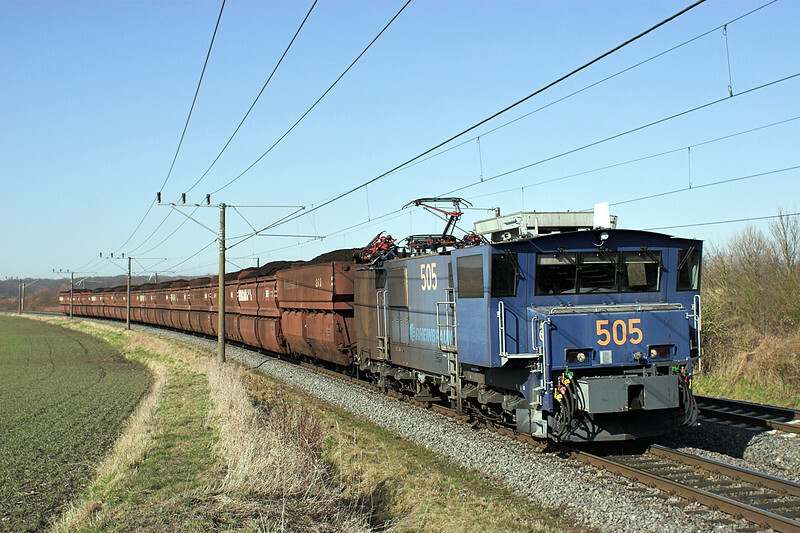 The fleet of unique locomotives operate in fixed rakes with their wagons, the extra-wide cabs allow them to propell them, the first warning one is doing this is a beeping noise in the distance eminating from the tail/headlight on the rear wagon. The fleet is made up of 10 blue electric engines (as seen above) which date from around 1999 and a much larger fleet of green liveried locos (below) dating from 1954. There are also a few diesel locos used for shunting in exchange sidings located at various points on the network. One such yard is at Frechen. After a lovely late afternoon photographing this unique line we adjourned to the brewpub in the old station building there and observed several freight trains running past the window down from the yard to the Rheinbraun system. The unfiltered Kolsch they serve in the Alter Bahnhof is a highly recommended drink to accompany eating food and watching these movements! Having spent all afternoon by the Rheinbraun/Nord-Sud-Bahn we had to put off our visit to the areas other unique railway until the following day. Unlike the Rhinebraun, the Wuppertal Schwebebahn is much more well known, especially after Michael Portillo visited it during one of his televised European Railway Journeys. Wuppertal is located just east of Düsseldorf and is spread out for about 10km along the valley of the River Wupper. It is this linear geography of the town that lead to the building from 1897 of a suspension railway using mainly the course of the river. I felt perfectly safe on it, despite the distinct rocking of the cars when you board them, though I only found out afterwards about the two major accidents. The most recent, in 1999, was the most serious when the first train of the day hit some debris left by workmen and fell into the river, killing 5 and injuring 47. The other occurred in 1950 when, I kid you not, an Elephant jumped from a train into the river. What possessed anyone to think taking an Elephant on the a suspension train was a good idea I don't know, but they did and you can read a short article about Tuffi HERE. 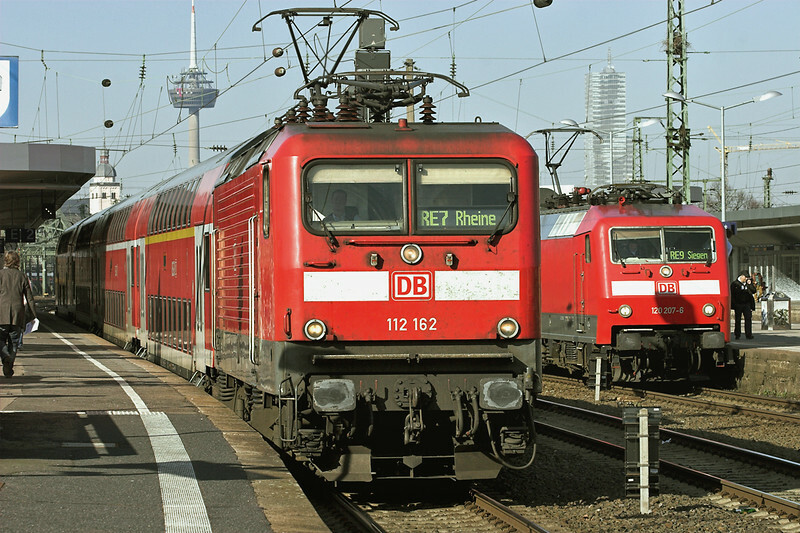 The current fleet of 27 trains were built in the 1970s. Those that saw Michael Portillo's program will have seen him travel on the preserved 'Kaiserwagen' which operated the first service in 1900. This performs regular tourist trips where you can book and have wine and cheese onboard for around €21. We were lucky that it was out on the day of our visit with a film crew onboard. We got a comprehensive photographic record of this line in only about 2 hours thanks to the very frequent service. Needless to say this line is also included in the NRW Day Ticket, unlike if it had been in Britain! The rest of the day I spent in Köln with an hour photographing at the Hauptbahnhof and then moving to the freight hotspot of Köln West, about 10 minutes away by train. There is an eclectic mix of trains to be seen here with locos from Belgium and even Switzerland passing. Rather than bore you with too many details, all the pictures from this day can be found HERE. Like the Monday, Thursday was mainly a day of travelling back to England. I spent an hour photographing a few trams in Düsseldorf itself. There is a comprehensive network both above ground and below which cross the City Centre by the 1980s built 4-track tunnel. The trams on this latter 'U-Bahn' network are actually really comfortable with wooden styled interiors and soft seats: some even have Buffets in them! Given that the U-79 extends an hour away to Duisburg, these refinements are probably necessary. Whilst most of the fleet on these routes are Deuwags 'Stadtbahnwagen Type-B' dating from the 1970s, there are still a handful of older Deuwag trams in use, seemingly only on the U-75. Sheffield's trams were tested on this system before being shipped to Yorkshire. I used the local stopping service from Aachen as my return route over the border, and having about two hours in Brussels spent an hour of that photographing at Bruxelles-Nord station. This station is much better for pictures than Midi where Eurostar terminates. How it has changed though since last year: virtually all loco hauled trains are now operated by the new Siemens Class 18/19 locos, with just a few class 21/27's left and certainly none of the old class 23 and 26. There are still a lot of the old multiple units types knocking about, the oldest now over 50 years old, but deliveries of SNCB's Desiro units seem to be also speeding up; I would recommend, if you can, to try to manage even just maybe a day trip to get some photographs of these as soon as possible. I hope my ramblings here might persuade one or two of you to seek out these rare lines in Germany, I could easily have spent much longer investigating the NRW area as it still has a reasonable amount of loco hauled services with older Deutsche Bahn classes 110/111/112 and 143 on both local and regional services; being also the 'power house' of Germany, from an Industrial point of view, it is also a very good area to go for freight activity, though the very nature of the busy passenger and goods operations means they are segregated to a large extent by freight only lines and by-passes. 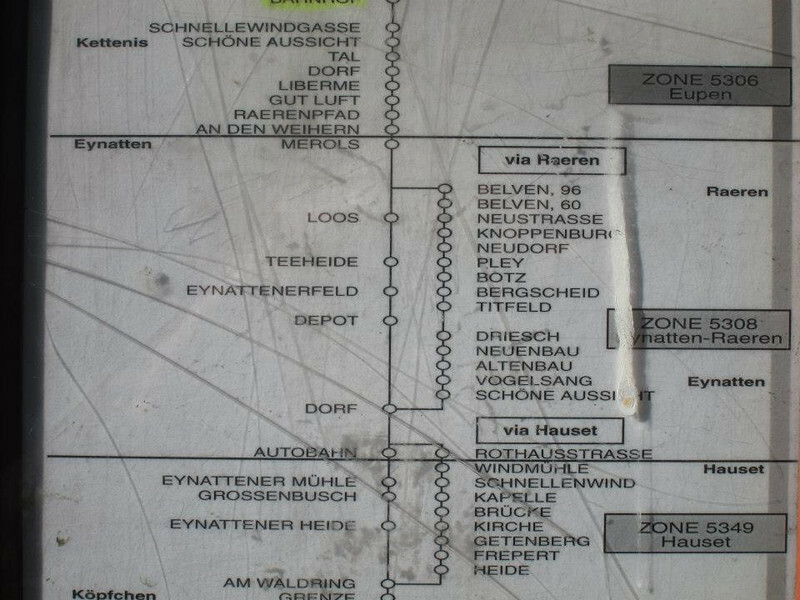 I shall leave you with a picture that my friend Richard took of the Eupen to Aachen bus route timetable. We had a very amusing 10 minutes waiting for the bus searching out all the rude stop names. Small things please small minds! Bye for now.